Decks by Zeic built an absolutely stunning deck for us! I’m writing this while sitting on my deck now! Their craftsmanship is perfection. It’s exactly what we dreamed of and more. 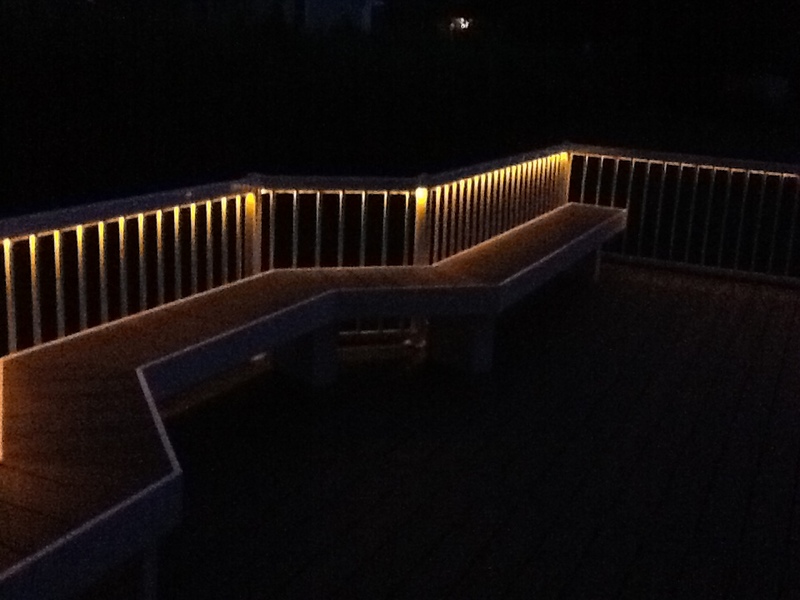 They were extremely professional, prompt and a pleasure …MoreDecks by Zeic built an absolutely stunning deck for us! I’m writing this while sitting on my deck now! Their craftsmanship is perfection. It’s exactly what we dreamed of and more. They were extremely professional, prompt and a pleasure to work with! From day 1 arriving early in the morning and leaving late in the afternoon everyday. Whenever we had a question they took the time to explain. If we asked them to change something on the deck, they obliged and always did so with a smile. We are so very happy we went with Decks by Zeic and whole heartedly recommended them! Reply0LikeThanks for your feedback!There is a problem. Please try again. 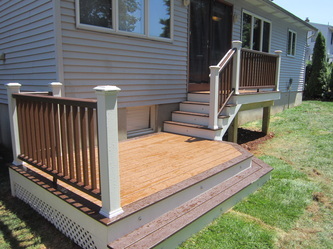 You will not find a better company to do your deck project! They do the work themselves. They do not hire crews. They are meticulous and do extra detail work that isn't even in the contract. They have great pride in what they do and do not finish until you are completely satisfied with the work! Call Decks by Ziec! These guys are the best in the deck business! It is a really daunting task to find a good contractor period. I also knew that Trex was extremely pricey, so I knew that we had to do some research to find the right one. We were referred to Ziec by another contractor we worked with, who had work done by them. They are extremely responsive. We got an estimate within days of contacting them. I just had a good feeling about their work based on seeing their portfolio of pictures and meeting with them. I have to say our Trex porch and back steps look absolutely amazing. I cannot stop looking at it and have gotten so many compliments already. We are so excited to have maintenance free steps and porch. The Ziec team is super efficient, on time, do spectacular/detailed work and their prices are very reasonable. Our project started on time as we scheduled and was finished as we anticipated. It looks like night and day (compared to before). I would not hesitate to recommend Ziec. I would love to use them again in the future for other projects. 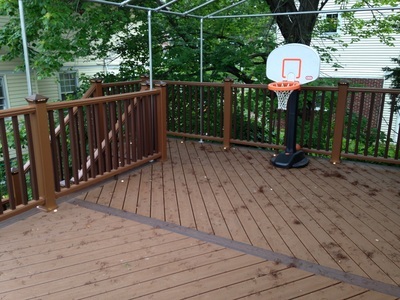 We absolutely love the deck built by Andrew and Thomas. Thorough professional work by Ziec. They are very responsive when your needs and respond back with any queries almost immediately!! They were in and our in 2 weeks with our entire deck incl. lights and customized trims. 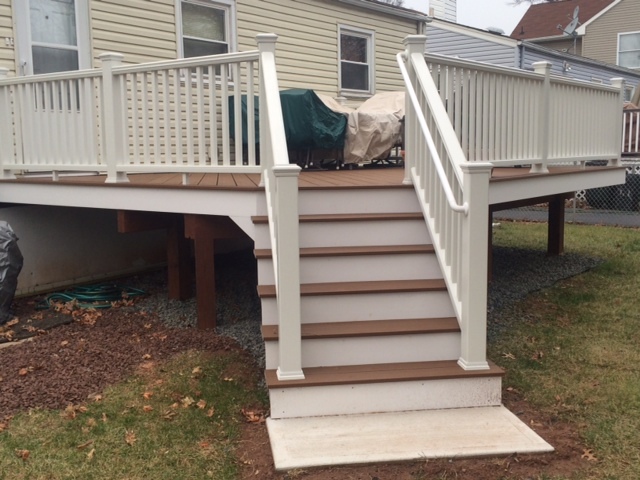 We did reach out to a couple of other deck builders, but no one could come even close to their work product and quality of service. Their prices are competitive as well. Would very highly recommend them for your deck needs. Andrew and Thomas, thanks very much for giving a wonderful deck to enjoy our summers for years to come. We had a deck installed at the back of the house. What a workmanship!!! Or should I say ART!!! Anybody who comes to my house is impressed of the quality, the precision and the beauty! Peter is professional, honest, punctual, and easy to work with. He has ideas, and seems to have great taste. Very reasonable prices for what you get. He is very busy; but worth the wait and every penny! Thank you Peter!!! Peter and his team did an excellent job on our deck project. My experience with Peter from the time he came to my home for the estimate to the completion of the job had been pleasant. Peter was easy to work with and a true craftsman in deck building. Peter took pride in his work and he was the guy who built the deck from start to finish. He was also willing to work with the inspector and home owner to make necessary changes along the process. Peter completed the project on schedule. I highly recommend Decks by Ziec to others because I know Peter will personally stand behind his work and care about customer satisfaction. Decks by Ziec are the BEST.... My experience with brothers Peter and Andrew has been 100% positive. They are both true professionals and craftsman, and their attention to detail is amazing. They return phone calls, emails and texts in a timely fashion --- this is rare in today's world. Peter is passionate about his job and cares about the customer. At the end of the day, he wants you happy. Peter and his team will make sure you are thrilled with the end result. Bottom Line === if you are looking to build a new deck or in need of repairs, you would be foolish not to call Decks by Ziec. 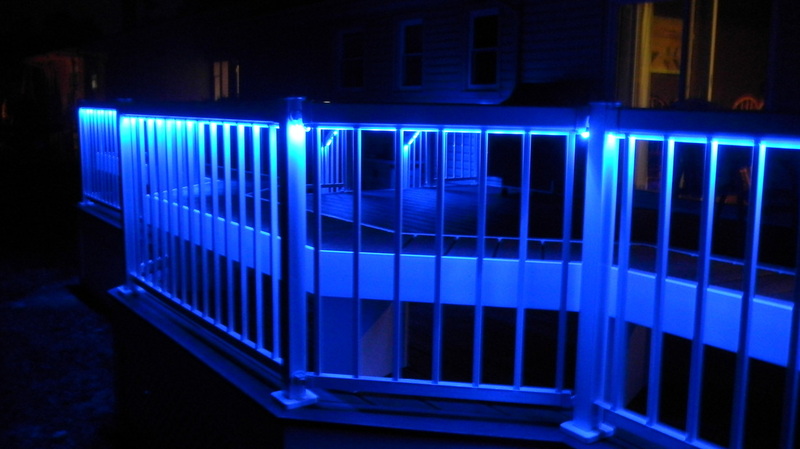 Call Peter on his cell at 908-275-7075 for ideas and to get an estimate. You can thank me later. We knew we wanted to work with Peter upon first meeting with him. In addition to being genial and easy to talk to, his knowledge and expertise impressed us. It was clear that he was truly a designer who could help guide our vision towards the right deck for our space. He proposed ideas but was extremely patient and never pushy. We felt confident during the design process that he knew what we wanted and would execute it exactly as we had discussed…and he did not let us down. Peter was very communicative throughout the project and was even able to begin our deck earlier than the anticipated start date. His professionalism did not waiver from the start to the finish of the project and we now have a beautifully crafted deck. Peter even built a custom storage cabinet that fits perfectly with our deck. Our experience with Decks By Ziec was nothing but positive and we would not hesitate to work with Peter again in the future. 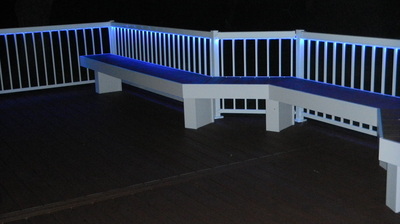 We used Decks by Ziec to refurbish, expand and customize our existing deck. We are thrilled! Our deck and pergola is beautiful, just ask the neighbors . Peter and his team communicated continually throughout the project, were prompt, worked hard, and are highly talented. Peter has great ideas and was happy to listen to ours. We highly recommend them for your next deck. 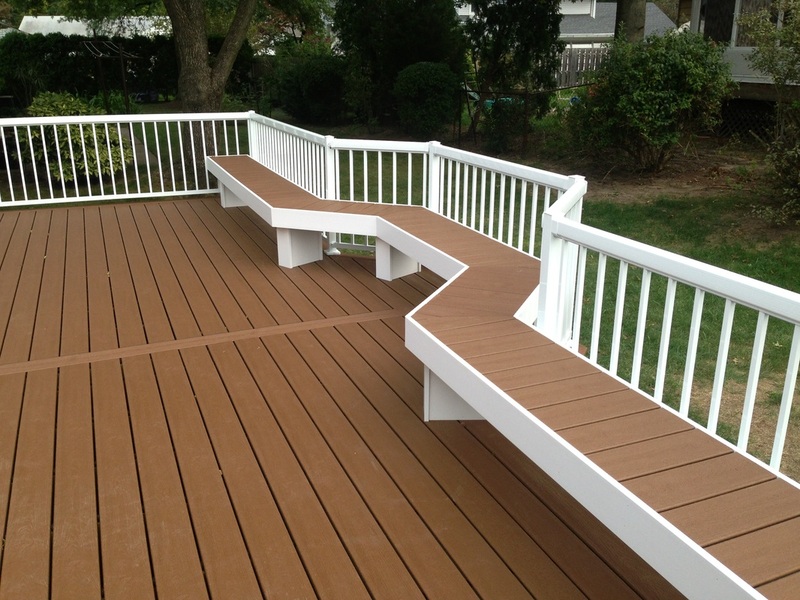 "If you are in need of a decking contractor there is no one better than Decks by Ziec. Peter and his team take special care in providing the finest workmanship, best customer care and personal attention. They did a composite TREX deck for me complete with lighting which is spectacular at night as well as during the day. Do yourself a favor - call them first and last. You won't be disappointed!" 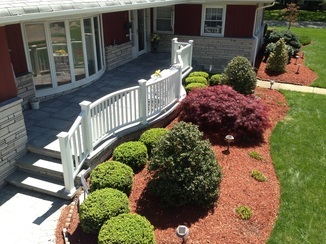 -Larry L.
From the initial meeting with Peter to review my vision for a roof covered Ipe deck as part of a backyard transformation, I was confident that he would do a great job. With Decks by Ziec, you get a small company with a hands-on owner with whom you will deal directly in every step of the process. Staying in contact was easy as he always answers his phone – no hiding behind voicemail or office staff. And his low overhead approach helps to keep the cost down. Ultimately, Peter and his team were able to make my vision a reality that my family will enjoy for years to come. Good contractors are hard to come by these days. They promise the world but always fall short. This was not the case with Decks By Ziec. Peter and his crew were truly hard workers that you can depend on. They started each day punctually and put in long hours to get the project completed on time. If any obstacles came up, Peter was always upfront with me. I would recommend Peter and his crew anytime. I'm sure you won't regret it. Peter has transformed our backyard into our own private oasis! He truly is a master of his craft. We recommend Peter to anyone who wants the perfect deck ! The Ziec brothers are truly the best there is and a pleasure to work with AND they are reasonably priced!!! You could not ask for a better combination. Andrew was the primary brother assigned to our job. He is a craftsman and extremely creative. Also, he is the nicest person ever, is very hard working and does not miss a day! We are extremely pleased with the deck they just built for us. Every detail was beyond our expectations. I can’t say enough good things about the Ziec brothers. We would definitely use them again. Thank you again for the wonderful deck you built for us!!! We are very pleased with the work that Peter did for us. He was very patient during the approval process. 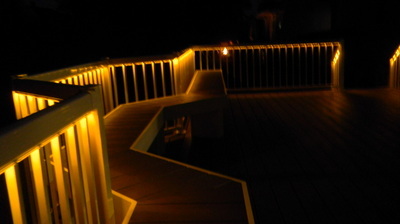 When we were finally ready, he was able to fit us in and completed the deck within the two week time frame as promised. During the construction period he would accommodate our little requests here and there to tweak the design to our satisfaction. Thank you Peter for the wonderful job that you did. We are so happy with our new deck that we are out there everyday despite this chilly spring weather. I recently contracted with Peter and Andrew Ziec of Decks by Ziec for construction of a small wraparound deck made of ipe, also known as Brazilian walnut. Ipe is a deep and darkly-colored, beautifully-grained, dense tropical hardwood. Another name for ipe is ironwood, a reference to the challenging nature of this material to work with and the expert handling and treatment it requires. Peter approached the project with great enthusiasm. Design space in the yard was limited so Peter's suggestions for the deck layout and placement had to be novel and creative. His design was inspired. Peter's brother, Andrew, a master craftsman in his own right, did the actual construction. His expertise, attention to detail, courteous, friendly and outgoing manner made the whole process a pleasure from start to finish. And the final product is a joy to behold and a home improvement to be proud of. As a veteran of a number of previous home improvement projects, there are few I would characterize as positive. My experience with Decks by Ziec was extraordinary. The Ziec brothers are artisans and masters of their trade, qualities in notoriously short supply in the contracting community. From the first time that we met with him, his follow through on returning an "estimate inquiry" to his visit to our home on a Sunday, to fulfilling his start time commitment and end time completion, we have never hired a more dedicated and committed individual. "The Ziec brothers did a fantastic job. They built a beautiful deck in a very short period of time. We're happy to recommend them." "From start to finish, Decks by Zeic did a great job! Peter's Co-Worker took down our 9' x 10' wood deck and built a new 14' x 18'.5" deck with Trex material. He arrived promptly every day, provided expert craftsmanship and closed out each day with clean-up of all material. We could not be happier with our new deck. 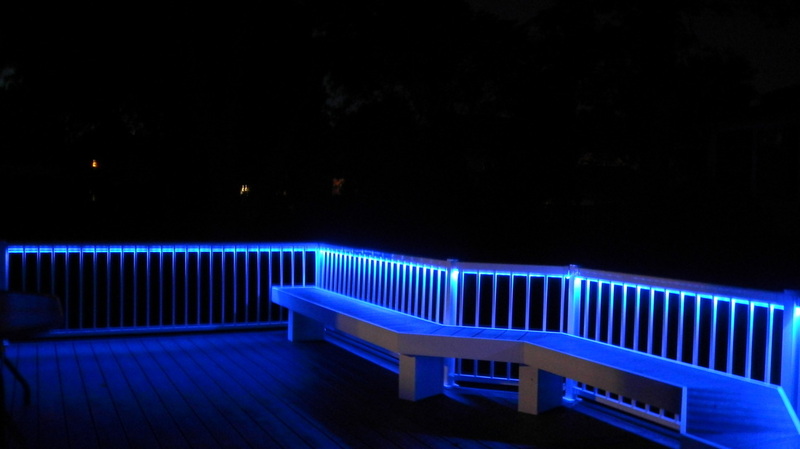 We would recommend Decks by Zeic to all of our family and friends." Joe, Carla, Alexandra, Zachary F.
We have never had to search for a contractor to do home improvements in our home. The time came to where we wanted to have a deck rebuilt and a deck added onto our pool. After a long search, we will NEVER have to look for another contractor again because we will always call Peter. I have heard and seen first hand that most contractors are next to impossible to get on the phone or even talk to. Peter was always in close contact when I needed to ask a question. When we first met him he spent 1 hour in the rain measuring and visualizing how our backyard could look. 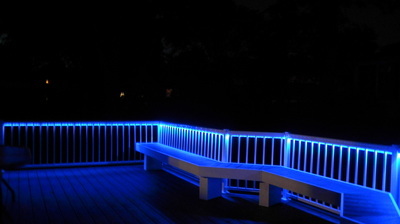 He listened to our ideas and augmented them to create the beautiful deck that we never thought we could afford. He is meticulous about his details. He even purchased a Trex heating machine because the company he used before didn't seem to meet his high standards. He is not just a contractor but truly an artist. He treats your project as if it was his own home and family. He and his brother work extremely well together. I know this sounds like we are being overly positive but it really was an excellent experience. When ever I read reviews and they never say anything negative, I am always leery of believing that these are actually clients. So here it is, he is very punctual and arrives early and stays late - he almost seemed like part of our family. His enthusiasm towards his work is obvious to anyone that spends a few minutes with him. His stamp of approval means it is truly the best piece of artwork that money can buy! backyard to an absolutely beautiful extended living space. We really appreciate it ! 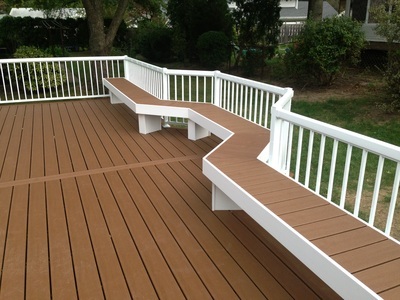 I would recommend Decks by Ziec to everyone who deserves quality work , no hassle and reasonable pricing. Peter from Decks By Ziec was extremely helpful in helping us design our custom deck. The material is top notch and the entire job was completed within a weeks time. 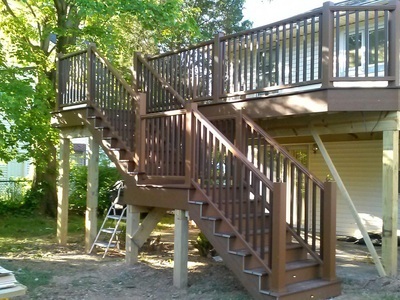 Peter was able to renovate our old wooden deck and transform it into a new space that is completely unrecognizable. He was very professional and gave us plenty of referrals from his previous work. He actually didn't want us to sign a contract with him until we viewed other jobs he had done and spoke with his previous customers. I would refer any of my friends and family to Decks By Ziec. We were very happy with the outcome. for unlimited storage in a curved area of the deck which was a feat in itself. the fine details necessary to bring it over the top. about his work and making his customers happy and that reflects in his work. this company. They are worth the wait! right person to build us a deck. Peter to design and build for us. We could have had anyone build us a deck but Peter and AJ built us an amazing piece of artwork that we are in awe of. His vision and craftsmanship exceeds all others in his field. Not only are they talented but they are dependable, extremely pleasant, on time and very considerate. We are already looking forward to the day when we can work with Peter and his team again. I would highly recommend Peter and I am happy to have put my faith and trust in his vision. He transformed the back of our home that was bland and unattractive and made it grand and majestic. He will continue to amaze us with his work! heartbeat. Thank you once again! reputation more than any other contractor we've worked with, and he has "a guy"
Peter, I just wanted to thank you again for the beautiful well crafted custom deck you created for us. Your attention to detail and quality of construction is unsurpassed. You have been a joy to work with. You addressed any and all concerns we had immediately and made us feel comfortable during the entire project. We have received many compliments and will happily recommend you to all. 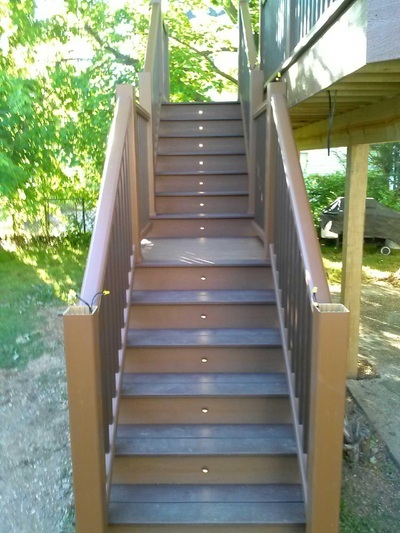 Having Decks by Ziec was one of the best experiences in home improvements we have ever encountered. They were professional, reliable, creative and understood our vision and made it happen. The quality of work was beyond our expectations. Perfection is their ultimate goal. We can honestly say we have never worked with a company that cared as much about the finished product as Decks By Ziec did. Decks by Ziec installed an elevated 2nd story Deck to my home. We are really enjoying our new deck and appreciate the excellent service you and the crew provided. From design through construction, the process was seamless. You were very responsive to questions and demonstrated your decking expertise via your suggested designs, manufacturer and materials. The crew showed up on time, the costs were within budget and the result was a gorgeous deck that we'll enjoy for years. Highly recommend! Thank you, Peter and A.J., for giving us the most beautiful deck in the neighborhood! We’ve had several requests for your cell phone number from neighbors who want to replace and update their decks with the same style and craftsmanship you brought to our home. Once the design was decided, on a collaborative basis, your ability to work to plan with little involvement by us was a relief. You came early every morning and worked steadily until the job was done, on time and within budget. We found the creativity you brought was way above that offered by other contractors we were considering. The new outdoor living space of this deck has added a wonderful expansion to our home. Thank you and good luck as you go forward. We feel lucky to have found you! Peter has just finished our porch and railings. Our original railings were wrought iron and had to be painted every three years. 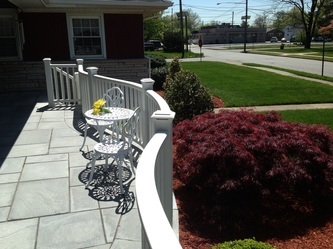 Since the railings had curves, we could not find any place that could duplicate our original railing curves until Peter. Judge for yourself -see how beautiful it looks. Just wanted to send this email to say Thank You once again for the amazing work you did on our deck. As always....you were quick & efficient, your quality of work was top notch, you gave us a fair price with no deck board waste AND you were friendly & neat! The above are just some of the reasons why we decided to use you again this year to help build our dream deck. I am truly grateful to Peter and his workers for giving me the dream room and deck I always wanted. I was looking for a custom three season room and deck, not the typical cookie cutter three season rooms and decks. Peter delivered and then some. He is very talented and detail oriented.He takes pride in his work and it show; he treats the project like it's his own.He is reliable and committed. He takes responsibility and doesn't use any subcontractor.He took the time to speak with us and explain the job. He gave us some suggestions, that I would have never thought of, comes with experience and knowing your job. 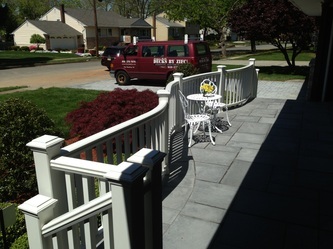 He uses quality products and is an excellent contractor; I would not recommend anyone but Decks By Ziec. His designs are amazing; you would not be disappointed. Peter is not only one of the best contractors I know but also a wonderful person. I would consider Him a friend. Craftsmanship!!! Come by anytime for a BBQ!! We would not hesitate to recommend Decks by Ziec. They are professional, were here when they said they would be, did the work cleanly, and did the job for a good price. Not knowing exactly what colors and options, he has a good idea for ideas. He was flexible to meet with us at times that fit our schedule. He took care of the permits and inspections and everything passed with flying colors. 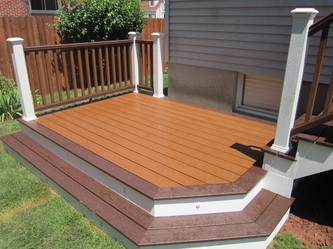 The deck is absolutely beautiful and we can't say enough for his workmanship! Thanks Peter! Brad and I just wanted to write you a quick email to let you know how pleased we are with our new deck addition. We were impressed with the quality of your work and how quickly you completed our job. You were always on time, very personable, left our home clean every night before you left, scheduled and completed all the inspections on your own, and most of all we loved the design you created for our addition. We look forward to working with you next summer when we replace the next two sections of our deck. We used Peter from Decks by Ziec to build our 16’x18’ Trex deck. We loved the fact that he specializes in decks and patios and we weren’t going to be hiring just some random general contractor. Also out of the three people we had come out and give an estimate he was the lowest in price. When Peter came to give me an estimate he spent over an hour discussing different ideas and the layout of the deck, as if it was his own home. Peter told us he was doing a job four blocks from my house and kept saying “go over there and look at the job, you can see my work”. That right there told us he took great pride in his craftsmanship, and we were soon to find that out. When the project started we liked the fact that he would actually pick up his cell phone when I called him with any questions, or at least called me right back. I was very surprised with how neat and tidy they kept the job site. Although they were returning the next morning, at the end of each day all the tools and materials were in one pile and covered with a tarp. Peter was very hands on throughout the whole job, and very easy to work with. We truly love our Trex deck, and couldn’t be happier with the way it came out. I even told Peter when he is less busy we would like for him to build a three season room for us. Have Peter build your dream deck. From start to finish, it was very smooth. There are no limits to what he can build. It is the most solid and beautiful deck I have ever seen. I am proud to have a Deck by Ziec. Peter is the Best! We are happy to write this letter of recommendation for Peter of “Decks by Ziec”. Peter is a true craftsman with meticulous attention to detail. We were thoroughly impressed with his quality of work! The end result turned out to be better than we envisioned. 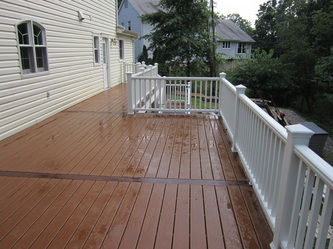 The deck not only met our expectations, it exceeded them! 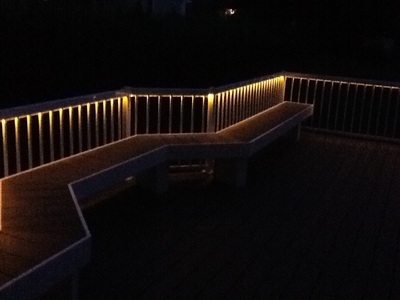 Thank you Peter…we LOVE our deck! I just have to say how often does a contractor show the same interest in a project after it is finished?! Peter almost seemed compulsive during and after the deck was completed to make sure I was happy not only with the quality of the work done but about things like cleanup. I also didn't expect to see some "finishing touches" which enhanced the appearance of the deck in ways I just couldn't discover on my own. I would have confidence hiring DBZ for other outdoor projects as well. Good man. beautiful job. Anyone looking to have a deck built that's the company to go with. I found them to be honest and reliable and the job site was kept neat and tidy but most of all the job was done on time and on budget.